Thank you Lorissa’s Kitchen for sponsoring this post. Lorissa’s Kitchen makes delicious snacks using high quality meats like 100% grass-fed beef and chicken raised without antibiotics! Click here to purchase Lorissa’s Kitchen on Amazon! Over the past six months, I have been on a journey to live a healthier lifestyle. Last year, my life was spinning out of control with our move and custody battle! I was completely burned out with not taking care of myself. So when 2018 came around, I decided this year was going to be different. I decided to find time that I "didn't have" and go to the gym at least three times a week. I decided to make myself an actual breakfast instead of eating a half-eaten piece of Aimery's leftover toast while running off to work. I started drinking my coffee while it was hot, instead of after it's been microwaved three times and still finishing it cold. Does any of this sound familiar to you? As parents, I think we can all relate that it's always easier to put our kids first and not take time for ourselves. And as a single parent, it's pretty much impossible to put our time and money towards anything other then our kids. For me, when my life gets stressful, the first thing to go is my healthy lifestyle. Cooking nutritious meals turn into picking up fast food on the go, and going to the gym is replaced with staying up all hours of the night working. Making these unhealthy choices only leads to me being more unhappy and stressed about life. When I notice my life getting out of control, I do these three things to get myself back to living a happier, healthier lifestyle! We could all use a small dose of down time every day. And if you're a parent, you especially need to allow yourself to use the personal control+alt+delete button daily. If we don't take a personal restart every day, we're just going to burn out and it's not fair to us OR our kids! I have found that I am able to get more done if I spend 30 minutes everyday doing something healthy for myself. Whether that be going for a run, making a healthy dinner, or something small like washing my hair - these are all important things to practice self-love. Remember that your little ones need to see you happy and healthy, as much as they need to see you getting everything done on your to-do list. Be easy on yourself and remember that you are important too. If you are a parent, then I think it's safe to say that your diet revolves around kid-friendly food (anyone else eat hot dogs and mac and cheese three times this week?) and snacks in your purse that your picky two-year-old will eat. This week, I challenge you to also pack healthy snacks for yourself while running out the door (fruit snacks do not count as healthy). 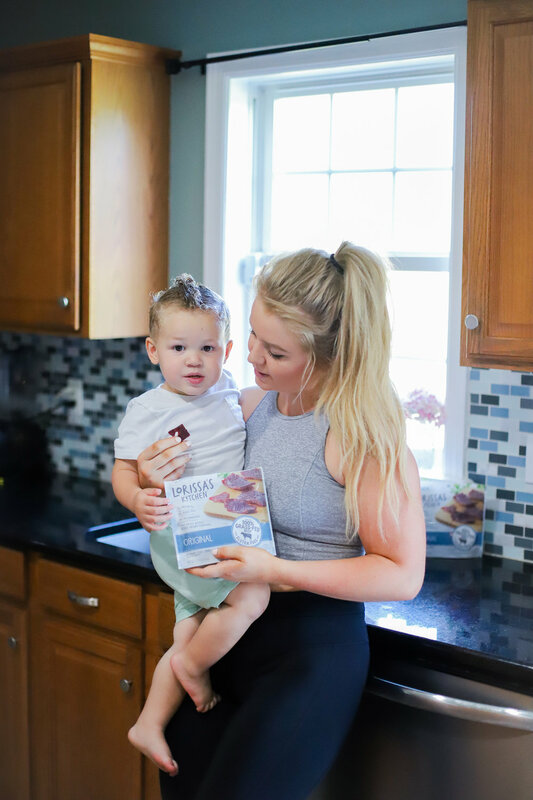 Recently, I've been loving Lorissa's Kitchen protein snacks while on the run. Lorissa’s Kitchen makes meat snacks that are made with only the highest quality meats including 100% grass-fed beef and chicken raised without antibiotics, and are gluten-free so you won’t find preservatives, added growth hormones added MSG, or added nitrites. They contain a good amount of protein in each serving and they are a great healthy option while on the go. Check out the Korean Barbeque Beef Steak Strips, Ginger Teriyaki Chicken Cuts and Original Beef Steak Strips flavors! Discover more about what Lorissa’s Kitchen is made of by checking out Lorissa's Kitchen on Amazon, and use code 20OFFLK to get 20% off your order! Come on, parents. You need to DRINK MORE WATER. Drinking at least half your body weight in ounces of water will change your life. Water will (most likely) solve all of your problems, and if it doesn't, it will at least make you feel 100x better. You'll be healthier and more motivated to get through the day. I am much more likely to drink water if I always have it on hand. Whether on my desk at work, in my gym bag, or in my purse - I always try to keep water bottle with me so I stay hydrated during the day. I have gotten into a habit of making sure I refill my water bottle every time I get Aimery a new sippy cup during the day so I drink more often. Anyone else's kid drink 1000 sippy cups a day? Apparently, if you aren't peeing for the 87th time today like my two year old is then you aren't doing it right. Making time for ourselves while balancing parenthood isn't easy. But practicing these simple tips can make it easier, and leave yourself feeling great! And you DESERVE it.